Op-Ed: In the ‘New Zimbabwe’, will the looting continue? So now that Robert Mugabe is gone, it will all be fine in Zimbabwe soon, right? Well actually, no. Even if the reformist rhetoric of the soldier-saturated cabinet could be taken seriously, how could even the most dedicated and humble collection of bureaucrats strip down the well-dressed emperors’ accumulation patterns honed by decades of deliberation and calculation? By DAVID MOORE. The story of the Zimbabwean coup (which was of course a con) is now well-known. Power-crazed First Lady and her ersatz and erstwhile Generation-40 gang persuade her husband to fire vice-president. He rallies the troops while hiding away and travelling somewhere/everywhere (how: by email and WhatsApp?). His army comrades – led by a man with an Italianised name and an Ethics Phd from a Pietermaritzburg college – take a few days to persuade/force the long dithering and quickly deteriorating 93-year-old head of party-state to give up. Thousands are in the streets urging the military on. “The Crocodile” – born-again, of course – swims home across the river praising the “father” just deposed to protect him from his disgraceful enemies. On his neatly prepared inaugural, President Emmerson Mnangagwa promises to revive the economy in a Paul Kagame-Deng Xiaoping sort of way, if everyone works hard. Meanwhile, all the new and faded superpowers are co-operating to help a revitalised finance minister revive an economy that would have died (and still might) by the New Year. They are hurriedly blending all the lessons learnt from decades of floundering Washington, Beijing, Kigali and Fast-Track Land Reform/Command Economy consensuses. Promises of compensation for the white farmers who lost their land flow like milk and honey. Elections? Sure thing: we have them sewn up anyway. So it will all be fine soon, right? Corruption will be a distant memory. The diaspora will fly or bus back, perhaps encouraged by a UNDP fund for once-exiled technocrats. The currency will peg to regional norms. Zimbabwe will recover its “second most industrialised in Africa” status, raising socio-economic and civil rights to their status at the morrow of freedom. The brutal years of Gukurahundi will be forgiven albeit never forgotten. “Western” donors’ dilemmas over whether to support liberal democrats or desperate dictators will have been solved by this soupçon coup while their hard-nosed investors will flock to the diamonds, gold, platinum, and tobacco and maize in Zimbabwe’s hinterlands. This could be the “democratic developmental state” over which consultants and World Bankers have been drooling for decades. 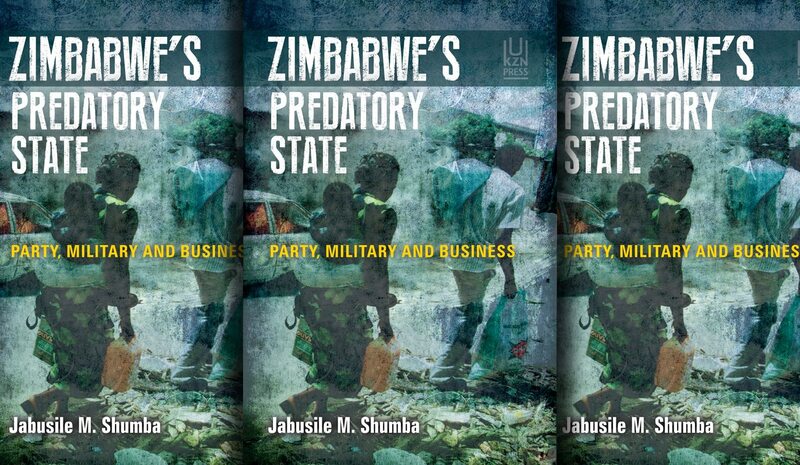 If you read Jabusile Shumba’s Zimbabwe’s Predatory State: Party, Military and Business, out next month from the University of KwaZulu-Natal Press, you will be convinced otherwise. Even if the reformist rhetoric of the soldier-saturated cabinet could be taken seriously (really, are they going to put their billions stashed offshore into the state’s coffers to slip under a three-month amnesty? ), how could even the most dedicated and humble collection of bureaucrats strip down the well-dressed emperors’ accumulation patterns honed by decades of deliberation and calculation? Shumba’s analysis of Zimbabwe’s long structured rent-seeking modes of accumulation is simultaneously straightforward and sobering. Zimbabwe’s Predatory State slices incisively into the intricately meshed networks of Zimbabwe’s ruling party and military apparatuses with the business of mining, agriculture, finance, energy and transport across the country’s political economy. He dissembles any pretences of developmental statism with subtle scorn. Patron-client relations prevail; predation occludes the transformational potential of the real process of primary accumulation that turns subsistence agriculturalists to proletarians and industrious proprietors. All we get are the perverse incentives of resource curses, conspicuous consumption, de-industrialisation, and a peasantry in penury. Max Weber’s dreams of bureaucratic rectitude dash as the diamonds slip out via criminal chains. Marx’s and social democrats’ hopes for a stern yet participatory proletariat fade as industry dies and informal vendors take up the slack – permanently lumpen, largely. Adam Smith’s yeoman-like aspirations are twisted as the agrarian revolution remains stalled. Moreover, the veneer of democracy that comes into play with a few well-orchestrated elections is thin indeed: violence is meted whenever the Joint Operations Command in charge of this long evolving scheme is threatened. Indeed, the well-organised violence of war hastened the trilateral project: involvement in the 1998 Kabila vs Kagame war enriched a lot of Zimbabwean generals via mineral extraction, manufacturing uniforms and boots, and running trucks and planes back and forth. Ironically, the deep depression of the 2000s accentuated the power and wealth of Zimbabwe’s anti-developmental élite: hyper-inflation amid artificial exchange controls made those with access to the Reserve Bank super-rich, and when the forex dried up the Marange diamond fields appeared. Artisanal miners were thrown off as the soldiers and their offshore partners marched in. And the banking sector? Shumba’s surgical precision makes today’s looming crash entirely predictable. The ethanol scam is easier to understand than the arcane financial schemes, and adds a few nasty white wheeler-dealers to the party. To top it off, no soul in this cabal bothers to pay for their electricity. As comparisons of developmental trajectories go, Zimbabwe approaches Mobutu’s and Kabila’s DRC, neither South Korea nor (like it or not) Rwanda. There are only two things missing in this grand exposé. First: Shumba waits until his very last line to hint at how the ruling class’s predatory politics lead to the very Zimbabwean coup we have just witnessed. He will be better prepared than most to tackle those intricacies. Second, and much harder: what can be done to fix up the mess?